- Free to try, Easy to use, App works really well - Makes swings easy to compare so you can find your swing fault (refer below in review for further explanation) - The setup is hardest part without a stand (I made a diy stand) - Great app for practice (refer below in review for further explanation) - Revolutionary technology!!!! Nothing that comes close to it! Let me start by saying I have attempted to organize this review in many ways, with the intent of making it easily understandable and not with a list of technical mumbo jumbo. First, I would like to say that this app was very easy to use! I will start of by explaining the general purpose of the app. After that, I will take you through the steps in capturing a swing and through that process explain all the features of the app. 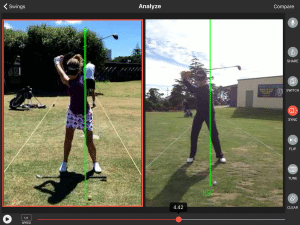 The Swing Profile app helps you compare different golf swings easier so you can notice the differences between them. The differences are potentially your swing faults. The app does this through many technologies which we will discuss below. How to capture a swing? There are three ways you can capture a swing: 1) REPLAY 2) AUTO: A&B 3) Manual 1)REPLAY -Replay is a mode you use when you are practicing by yourself at home or on the range. -The device can be set up on a chair or a holder, which can be purchased from their website. I personally feel that the set up can be difficult, but once it is done, it is good to go. I made a diy Ipad mini holder using a broken golf shaft, tape, and a clothes hanger. I did not find it very difficult to make, it took me about 15 minutes. -After the initial set up of the device, next you fit yourself in the box provided on the screen. -Keep still until it turns from yellow to green. Once it turns green then you can swing. -When you swing it captures your swing automatically and plays it back to you. (You can choose different speeds and segments you want to replay depending what you are working on) (Replay Speed: 1/1 Speed, 1/2 Speed, 1/4 Speed, 1/8 Speed) (Replay Portion: Full Swing, First Half, Second Half, Mid Half) -You can repeat this process without having to touch the device; you have to just fit yourself into the box and wait until it turns green and swing again. (The app saves all your swings in the swing library on the main screen. 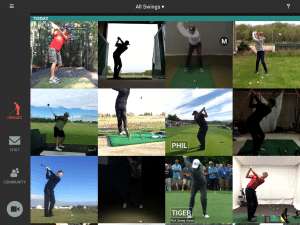 However, the amount of swings that will be saved will depend on which subscription you have http://www.swingprofile.com/pricing) Overall, I feel that the replay capture mode is great when you are working on changing an aspect of your swing. For example, you might be wanting to stop swinging too much outside to inside with your swing plane (like slicers do), or just working on ingraining setup changes such as hip bend or knee flex, etc. The app provides you immediate video feedback on what you are working on and if you are doing it right or wrong. Knowing what is right and wrong is another question, which I will discuss below in effectiveness. 2) AUTO: You can use auto mode in two ways A and B A) You can capture swings from television, YouTube, or any screen that plays a golf swing -You go through the same process as above; fit the golfer in the box provided, keep the device still until it turns from yellow to green and the app does the rest. 1) Analyze (one swing) vs 2) Compare (2 or more swings)1) Analyze (one swing) -The video of the swing will come up on the right hand side with the 7 picture sequence on the left hand side -At this point you can press play (lower left hand corner) -This will play the video while at the same time highlight the picture segment the video is in. On the right hand menu there are 5 features: 1. Voice over -(You can record yourself talking over the video giving instruction. This is great for golf instructors) 2. Share -You can choose to share video only, sequence image only, or video and sequence image together -You can share it via email and social media (I won’t get into too much depth but facebook twitter etc. 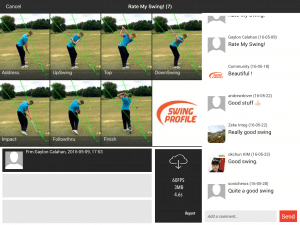 you get the point) -Post to community (Swing Profile has a community that you can post your swing to and/or download others swings and where people can make comments to help you or your swing and obviously you can do the same for them) This aspect of the app will be very helpful for golfers, because as the old age saying goes, “two heads are always better than one”. 4. Tune -This feature lets you adjust the swing plane line and frames if the software was off in sequencing -In my experience, the software has been perfect in regards to the frames but the swing plane sometimes does not automatically work or it can be inaccurate. Therefore, you will sometimes need to go into the tune feature to adjust the swing plane lines, that being said it is very easy to adjust the lines. It also has a reset button if you muck things up too much. 5. Draw feature -Press on the video screen on the right side to draw on it -There are some negative aspects of the drawing feature -First there is only one color yellow (would be great if there were multiple colors) -Also, drawing shapes like circles for head movement is not the easiest (would be great if you could choose a shape then enlarge or shrink and then move it around on the screen) -Also, another negative is that you can only erase the last thing you drew (would be better if you could choose an aspect you want deleted, not just the last one you drew) -On the positive side, when you draw an angle it gives you degrees of that angle. This is very helpful for setup etc. -In my opinion, I feel that this feature of the app could be improved on. Is video instruction an effective tool? Based on the studies I have read they mostly compare efficacy of video instruction relative to that of verbal and self-guided instruction. The following qoute is from the article “The Use Of Videotape Feedback In Physical Education by Jason Suby”(http://www.westpoint.edu/cfe/Literature/Suby_09.pdf) I got to give credit where credit is due. Great paper that sums up everything!!! “There is a consistent theme throughout the literature that VTFB (videotape feedback) tends to disrupt a subject’s performance initially, much like that of verbal feedback. Reasons for this immediate disruption may be caused by a change in bio-mechanics or even the cognitive effort linked to these changes. However, when used consistently, especially coupled with verbal feedback, VTFB has demonstrated a positive impact on overall performance for most subjects. Another controversial aspect of this learning and assessment method is that initial use may increase anxiety because of the fact that self-images are naturally anxiety-provoking. Educating the subject beforehand regarding the possibility of anxiety is important and will enhance the learning process earlier.Finally, the use of VTFB alone is not widely accepted in the educational field. Only those subjects that have a thorough understanding of exactly what a desired outcome should look like seem to be successful when using only VTFB as an assessment method.In addition, there have been many ineffective uses of VTFB documented. Such variables include: the level of the performer, type of skill or movement, instructor-provided feedback, and frequency of viewing. Despite the many potential downfalls associated with VTFB, research across the educational spectrum, from teaching autistic children emotional control to teaching a gymnast how to perform a new maneuver on the high bar, has concluded that VTFB coupled with verbal feedback produces the best outcomes in this type of learning and assessment”. Other great info regarding the effectiveness of VTFB 1)http://etd.lsu.edu/docs/available/etd-04052004-160403/unrestricted/Menickelli_dis.pdf 2)https://etd.lib.metu.edu.tr/upload/12605691/index.pdf 3)https://books.google.ca/books?id=ebQ0CgAAQBAJ&pg=PA282&lpg=PA282&dq=swing+profile+ review&source=bl&ots=Zt3GboovUF&sig=9K7pmjCHwWgEzhY aiOKqkXbUSDQ&hl=en&sa=X&ved=0ahUKEwjQyqm_4_PMAhWm zIMKHasDD_k4KBDoAQhUMAk#v=onepage&q&f=false The use of Swing Profile as a learning tool Swing profile will increase teaching and assessment of psycho-motor skills with the below 4 aspects over standard VTFB. Swing profile improves on VTFB by 1) Signaling, which is also known as cueing is the use of on-screen text or symbols to highlight important information. (Auto plane lines) 2) Segmenting is the chunking of information to allow learners to engage with small pieces of new information as well as to give them control over the flow of new information. (7 picture sequence) 3) Weeding is the elimination of interesting but extraneous information from the video, that is, information that does not contribute to the learning goal. (Cutting out unnecessary swing parts from the video) 4) Matching modality is the process of using both the audio and verbal channel and the visual/pictorial channel to convey new information, fitting the particular type of information to the most appropriate channel. 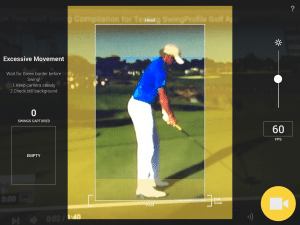 (Sync feature and voiceover) Source for the above info (https://cft.vanderbilt.edu/guides-sub-pages/effective-educational-videos/) Things to consider in your quest for golf improvement when using VTFB and swing profile -I am going to start by telling you my experience with Golf Tec. Golf Tech is a company that uses verbal and video instruction plus other technologies such as motion measurements. During my journey at Golf Tec I realized that learning the game of golf is not a linear learning slope, its more like a “S” shaped curve. I had breakthrough and even downward periods. I recommend choosing a swing method that have been proven (used widely by many players and is taught by multiple instructors) but also suited for your body (for example, if you are not very flexible dont try to mimick Rory Mcilroy). 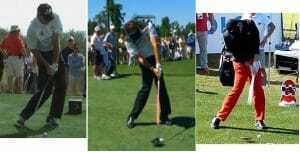 Once you have chosen the swing method (whatever it might be either the traditional swing method, the stack and tilt, or the Moe Norman one plane swing style) I suggest to do some research on the swing method so you can figure out if it is right for you. Then once decided give it around 6 months to 1 year of practice It takes a long time to ingrain muscle memory. If you get stuck take a few lesson from an instructor who incorporates verbal with video instruction. Also, someone who uses golf aids to help you understand feelings or positions can be beneficial. 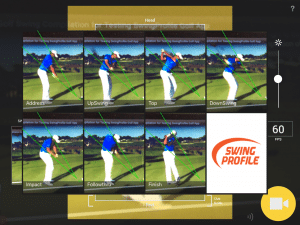 Record a swing of a player with the same swing method on the Swing Profile app then compare the pictures sequences with your own and try to figure out what is different and or the same. In other words, try to replicate/mimick/copy cat that persons swing. This is a good start. I also recommend posting your swing to the swing profile community to get feedback from others. Remember, “two heads are always better that one”!!! I feel that VTFB is great because there is no better way to understand what you are doing wrong until you see yourself on video. I believe this is true because there is a difference between what you think your body is doing in space and what you are actually doing. The literature today shows that VTFB for teaching and assessment of psycho-motor skills is effective. Swing Profile improves on VTFB by increasing your ability to learn by improving on signaling, segmenting, weeding, and matching modalities. My theory is that the use of Swing Profile will increase teaching and assessment of psycho-motor skills over standard VTFB. However, new studies will need to be performed to test this theory. -I will use this app for a long time to come, its amazing. 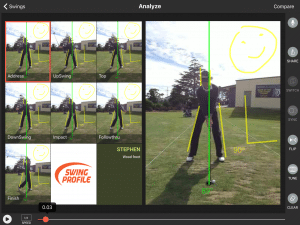 -It is the best video analysis software at your finger tips. Comment #1-Instead of filling up your phone or tablet with video that isn’t actually a swing, or trying to use a Bluetooth remote control to stop and start the camera, Swing Profile stores just your swing automatically and does it reliably. I’ve even got mine replaying my swings through my projector using an AppleTV and AirPlay so I get the large screen replay experience. It’s awesome! Comment #2-I love this app. You don’t need a friend to hold it or hit a button for you, and the tech works seamlessly. I use this religiously when I’ve been out of practice/away from my swing coach in order to get my swing in sync and back on plane. The automatic detection of the swing is seamless and flawless. Comment #3-This app is great. 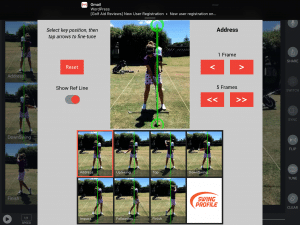 I can see where I need to improve frame by frame and get feedback from others on the app, can even compare to pros swings. Just wish I could export my videos. I will purchase the full version soon. Comment #4-“Does not work for me.” I bought a tripod and set this up to record my own swings. I get recordings of me walking to ball after starting app. Of me picking up my club. Of me checking the view to make sure I am in the frame. Of my backswing. And about every motion I make EXCEPT taking a full swing. iPhone 5s and lots of experience as a computer tech. I gave up and deleted the app from my phone. At least I had the FREE version to try it. Thank you for that! Great idea and I need the help, but I can’t use it. Comment #5-“Please Update!” This app has so much potential but is extremely outdated. There should be transparent menu bars so it doesn’t cover the swing, and it should be optimized for iPhone 5 and later. Not sure if the developer went out of business or what, but out of my 68 apps, this is only that hasn’t been updated. Seriously, to the developer, I like this app so much I’ll help you update it. Contact me. Comment #6-Golf Well tried it a few times! Auto detect doesn’t really work! Can’t seem to find front on view! 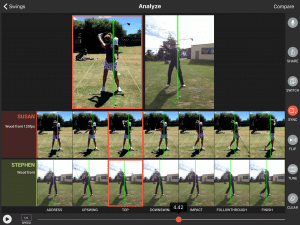 When analysing the swing it often comes up with an error telling you to delete the bad video! All in all poor but usable.. Just! As you all can see, just like with every swing aid that is out there….there will be positive and negative reviews from people that have used it. No swing aid is perfect for everyone, it will depend on the user, level of the golfer… etc. For me, the set up was the most finicky and time consuming part, but once it was set up, it worked flawlessly. -For more customer reviews refer to the links below under (Other Site Reviews & info regarding the device) Consumer testing I bet its happened to you that you are on the range pre round and you just cant figure out whats wrong with your swing This app wont fix your swing but will definantly give you a good chance at figuring it out on the range. I use it religiously on the range, love it. When I got others to test the app, everybody thought it was really cool and they were amazed at all the things it can do. 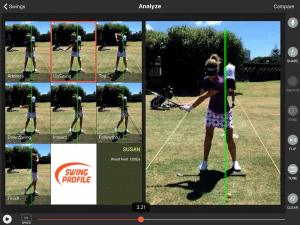 To conclude -This app is revolutionary -This will be the standard on golf analysis in the future -Why would you not use training wheels in your golf analysis -You can get your students to improve faster because you will be able to figure out whats really causing the swing fault -I had to borrow an ipad from my in laws to test this device because all my devices are android. After trying out Swing Profile, not only would I buy the app but I am now contemplating switching back to an ipad just for the app…that’s how good I think it is. 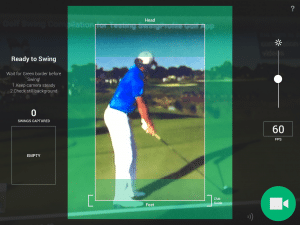 This application is an absolute must buy for all golfers who enjoy practicing and improving their swing.